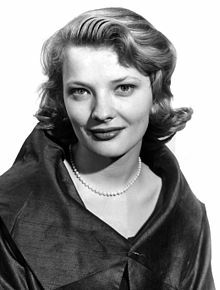 Virginia Cathryn "Gena" Rowlands (born June 19, 1930) is an American actress, whose career in film, stage, and television has spanned over six decades. A four-time Emmy and two-time Golden Globe winner, she is known for her collaborations with her late actor-director husband John Cassavetes in ten films, including A Woman Under the Influence (1974) and Gloria (1980), which earned her nominations for the Academy Award for Best Actress. She also won the Silver Bear for Best Actress for Opening Night (1977). In November 2015, Rowlands received an Honorary Academy Award in recognition of her unique screen performances. Rowlands was born on June 19, 1930, in Madison, Wisconsin. Her mother, Mary Allen (Neal), was a housewife who later worked as an actress under the stage name Lady Rowlands. Her father, Edwin Myrwyn Rowlands, was a banker and state legislator. He was a member of the Wisconsin Progressive Party, and was of Welsh descent. She had a brother, David Rowlands. Her family moved to Washington, D.C., in 1939, when Edwin was appointed to a position in the United States Department of Agriculture; moved to Milwaukee, Wisconsin, in 1942, when he was appointed as branch manager of the Office of Price Administration; and later moved to Minneapolis, Minnesota. From 1947–50, she attended the University of Wisconsin, where she was a popular student already renowned for her beauty. While in college, she was a member of Kappa Kappa Gamma. She left for New York City to study drama at the American Academy of Dramatic Arts. In the early 1950s, Rowlands performed with repertory theatre companies and at the Provincetown Playhouse. She made her Broadway debut in The Seven Year Itch and toured in a national production of the play. Rowlands costarred with Paul Stewart in the 26-episode syndicated TV series Top Secret (1954–55), and she guest starred on such anthology television series as Robert Montgomery Presents, Appointment with Adventure, Kraft Television Theatre, and Studio One (1955). In 1956, she starred in Middle of the Night opposite Edward G. Robinson. She appeared alongside her husband John Cassavetes on an episode ("Fly Baby, Fly") of the 1959–60 NBC detective series Johnny Staccato. She also appeared on an episode of the NBC western series, Riverboat, starring Darren McGavin, and the ABC adventure series, The Islanders, set in the South Pacific. Also in 1959, Rowlands appeared in the Western series Laramie episode titled "Run to Tumavaca". Rowlands made her film debut in The High Cost of Loving in 1958. In 1961–62, she starred in David Miller's "Lonely are the Brave", with Kirk Douglas and Walter Mathau and Carroll O'Connor. She starred as Jerri Bondi, the wife of Paul Bondi, (Michael Kane) but still deeply caring for ex-lover, cowboy Jack Burns, (Kirk Douglas) in a fantastically moving performance. In that same season, she appeared on ABC's Target: The Corruptors!, starring Stephen McNally. She also guest starred in CBS's The Lloyd Bridges Show and ABC's Breaking Point. In 1963, she guest-starred in an episode on the NBC western series, Bonanza, Laramie and The Virginian, and "The Lonely Hours", "Murder Case" and "Ride The Nightmare" on CBS's The Alfred Hitchcock Hour. In 1967, she was cast as socialite Adrienne Van Leyden in the prime time ABC soap opera Peyton Place. Rowlands and Cassavetes made ten films together: A Child Is Waiting (1963), Faces (1968), Machine Gun McCain (1969), Minnie and Moskowitz (1971), A Woman Under the Influence (1974; nomination for Academy Award for Best Actress), Two-Minute Warning (1976), Opening Night (1977), Gloria (1980; nomination for Academy Award for Best Actress), Tempest (1982), and Love Streams (1984). According to Boston University film scholar Ray Carney, Rowlands sought to suppress an early version of Cassavetes' first film, Shadows, that Carney says he rediscovered after decades of searching. Rowlands also became involved in the screenings of Husbands and Love Streams, according to Carney. The UCLA Film and Television Archive mounted a restoration of Husbands, as it was pruned down (without Cassavetes' consent, and in violation of his contract) by Columbia Pictures several months after its release, in an attempt to restore as much of the removed content as possible. At Rowlands' request, UCLA created an alternative print with almost ten minutes of content edited out, as Rowlands felt that these scenes were in poor taste. The alternative print is the only one that has been made available for rental. In 1985, Rowlands played the mother in the critically acclaimed made-for-TV movie An Early Frost. She won an Emmy for her portrayal of former First Lady of the United States Betty Ford in the 1987 made-for-TV movie The Betty Ford Story. In 1988, Rowlands starred in Woody Allen's dramatic film Another Woman. She played Marion Post, a middle-aged professor who is prompted to a journey of self-discovery when she overhears the therapy sessions of another woman (Mia Farrow). The review in Time Out described the character's trajectory: "Marion gets to thinking, and is appalled to realise that so many assumptions about her own life and marriage are largely unfounded: in her desire for a controlled existence, she has evaded the emotional truth about relationships with her best friend (Sandy Dennis), brother (Harris Yulin) and husband (Ian Holm)." Time Out praised the "marvellous" performances in the film, adding, "Rowlands' perfectly pitched approach to a demanding role is particularly stunning." Film4 called her performance "sublime", while Roger Ebert noted that it marked a considerable change in tone from her work with Cassavetes, thus showing "how good an actress Rowlands has been all along." In 2002, Rowlands appeared in Mira Nair's HBO movie Hysterical Blindness, for which she won her third Emmy. She was later seen in The Notebook (2004), which was directed by her son Nick Cassavetes. The same year, she won her first Daytime Emmy for her role as Mrs. Evelyn Ritchie in The Incredible Mrs. Ritchie. In 2005, she appeared opposite Kate Hudson, Peter Sarsgaard, and John Hurt in the gothic thriller The Skeleton Key. In 2003 she appeared as Mrs. Hellman in Numb3rs. She played a Nazi survivor whose whole family was killed. The family owned a painting that the Nazis confiscated. Later on the painting reappeared. The new owner lent the painting to an art gallery in Los Angeles but while on display it was stolen. The F.B.I. agent, played by Don Eppes, tries to figure out what really happened. Gena Rowlands received rave reviews for this role. She has been a spokesperson for people who were persecuted by the Nazis so this role was a perfect match for her. In 2007, she played a supporting role opposite Parker Posey and Melvil Poupaud in Broken English, an independent American feature written and directed by her daughter Zoe Cassavetes. In 2009, she appeared on an episode of Monk ("Mr. Monk and the Lady Next Door"). On March 2, 2010, she appeared on an episode of NCIS as lead character Leroy Jethro Gibbs's former mother-in-law, who is embroiled in a murder investigation. In 2014, she starred in the film adaptation of Six Dance Lessons in Six Weeks. Rowlands was married to John Cassavetes from April 9, 1954, until his death on February 3, 1989. They met at the American Academy at Carnegie Hall where they were both students. They had three children, all actor-directors: Nick, Alexandra, and Zoe. Rowlands married retired businessman Robert Forrest in 2012. Rowlands has stated that she was a big fan of actress Bette Davis while growing up. She played Davis's daughter in Strangers. Rowlands has been nominated for two Academy Awards, eight Primetime Emmy Awards, one Daytime Emmy Award, eight Golden Globe Awards, three Satellite Awards, and two SAG Awards. Some of her notable wins are a Silver Bear for Best Actress, three Primetime Emmy Awards and one Daytime Emmy Award, two Golden Globe Awards, two National Board of Review Awards, and two Satellite Awards. In January 2015, Rowlands was presented with a lifetime achievement award by the Los Angeles Film Critics Association. At the 2015 Governors Awards, she received an Honorary Academy Award. The press release described Rowland as "an original talent" whose "devotion to her craft has earned her worldwide recognition as an independent film icon". ^ Tim Gray. "Gena Rowlands, Spike Lee, Debbie Reynolds to Receive Governors Awards Oscars". Variety. ^ Dane County Register of Deeds, Madison, Wisconsin. ^ "Gena Rowlands Biography (1930?-)". ^ Assembly, 1927–1935; Senate, 1935–1939. Members of the Wisconsin Legislature 1848–1999, Informational Bulletin 99-1, Wisconsin Legislative Reference Bureau, 1999. ^ Lane, Lydia (November 21, 1980). "Beauty". ^ Registrar's Office, University of Wisconsin–Madison. ^ "Top Secret". Classic TV Archive. Retrieved 2014-11-26. ^ "Another Woman". Time Out. Retrieved April 1, 2013. ^ "Another Woman". Film4. Retrieved April 1, 2013. ^ Ebert, Roger (November 18, 1988). "Another Woman". Chicago Sun-Times. Retrieved April 1, 2013. ^ Chang, Justin (16 December 2014). "Film Review: 'Six Dance Lessons in Six Weeks'". Variety. Retrieved 29 September 2016. ^ "LAFCA Lifetime Achievement Award". March 29, 2015. ^ "Spike Lee, Debbie Reynolds And Gena Rowlands To Receive Academy's 2015 Governors Awards". AMPAS. Retrieved 5 November 2015. ^ "Berlinale 1978: Prize Winners". berlinale.de. Retrieved 2010-08-08. Gallagher, John Andrew; Caminer, Sylvia (August 24, 2017). "The Grande Dame of American Indie Cinema: A Lost Interview with Gena Rowlands."". MovieMaker. 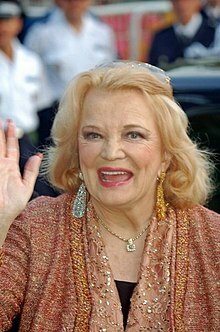 Wikimedia Commons has media related to Gena Rowlands.